The rainforest ecosystem is defined by dense vegetation, year-round warm climate, and about 50 to 260 inches of rainfall per year. According to Blue Planet Biomes, research indicates that almost half of all life on Earth resides in rainforests located in South America, Africa and Asia. Because of the plethora of life, there are many unique animal and plant adaptations in the tropical rainforest. Trees offer varied examples of plant adaptations in the tropical rainforest. Trees usually have branches growing out at a certain height. At that height, the branches move outward and upward, allowing rainforest leaves to capture as much sunlight as possible. In the rainforest, however, trees have evolved to grow to immense heights. This general tall height means that most of the trees have little to no branches the closer you get to the forest floor. Most of the branches are up at the top of the trees with only smooth bark and flowers appearing on the body of the tree. The bark is also extra thick, allowing many of the trees to survive damages inflicted by animals. To protect against insect consumption, most trees in the rainforest create toxic chemicals in their flowers to kill off insects. However, the human race has benefited from the toxic chemicals in the rainforest flowers, usually by harnessing the toxins and manufacturing vaccines and medicines against rare diseases. This can be thought as an example of how animals and plants interact in the rainforest. Another interaction seen between the plants and animals in the rainforest is through water consumption. According to National Geographic, the trees of the rainforest are so close together, a precipitation event called transpiration occurs. This creates a dense fog around the trees, which emits 200 gallons of clean water per year to the rainforest ground. To consume the assortment of food in the rainforest, many animals developed unique ways to eat. For example, many birds in the rainforest have strong, large beaks that can crush the extra thick shells of nuts; the most popular example of this is the toucan. For other animals, insects, like ants, are the main diet, so the anteater developed a proboscis-like tongue that can reach into every corner of an insect settlement to consume the bugs. Insects in the rainforest are typically stronger than other insects across the world. Many ant species, for example, can carry objects over 50 times their own weight. This helps the insects carry everything from small fruits to leaves for food. 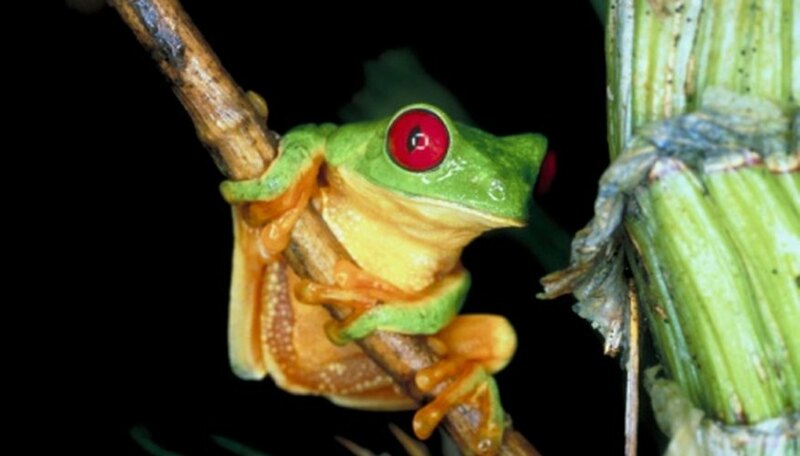 Many animals in the rainforest protect themselves through a number of defenses. One common defense adaptation is camouflage. Many insect species can mimic their surroundings so mammals or birds cannot differentiate between the insect or a tree leaf or a rock. Another protection is poison. Like plants, which can emit poison through their flowers, many animals have poisonous skin. The skin of these animals are covered with deadly poisons that can kill an animal just through touch. As a way to avoid confrontation, many poisonous animals have vibrant colored skin as a way to warn other animals. Fitzpatrick, Mark. "Tropical Rain Forest Adaptations of Plants & Animals." Sciencing, https://sciencing.com/tropical-forest-adaptations-plants-animals-8514102.html. 20 July 2018.